Nuestra espaciosa casa colonial se encuentra en una ubicación privilegiada para explorar el histórico distrito Centro de Mérida. La cocina está bien equipada, tenemos Internet de alta velocidad gratis, TV, una gran piscina, camas king size de alta calidad y cada habitación está bellamente decorada. Esta casa fue ofrecida en House Hunters Internacional en 2012. Cada habitación en la planta baja tiene una cama king size y su propio baño con ducha. Cada habitación tiene un pie fuera. Sale de un dormitorio en la planta principal a un patio interior, la otra paseos a la piscina. El dormitorio principal / familia ocupa toda la segunda planta. Consta de 2 dormitorios (1 con cama de matrimonio que conduce al segundo dormitorio con 2 camas individuales), un baño, un vestidor y su propio patio privado. Las habitaciones son muy grandes y espaciosas. Nuestra entrada conduce a una sala de estar / sala de televisión y zona de comedor cubierta. Camine más se entra en nuestra cocina que tiene 2 salidas a pie, uno a un patio con barbacoa y el otro sale a la piscina y una gran terraza con opciones de comedor al aire libre. 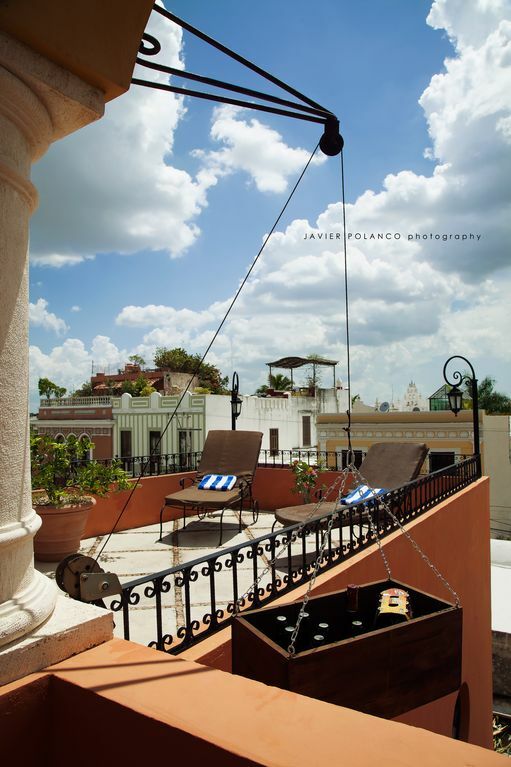 Nuestra terraza de la azotea tiene una vista de 360 ​​grados sobre Mérida. Ver la puesta de sol sobre la iglesia de Santiago y verlo llegar a la plaza principal. La terraza de la azotea se completa con un bar con fregadero, un camarero mudo, una zona de estar, un comedor, un inodoro, una terraza para tomar el sol y una terraza para observar los pájaros. La brisa de refrigeración y el flujo de aire a través de esta casa, creada por la estructura arquitectónica cuando se abren las puertas a los espacios de vida y la altura de las paredes en los patios, lo mantienen fresco y cómodo. Aire acondicionado rara vez es necesaria, pero está disponible. Cada mañana, los loros vuelan sobre y cada noche regresan. Siéntese en la azotea y ver ellos todos los días, a veces en bandadas de cientos de aves. Nuestra ubicación central significa que está a poca distancia de todo lo que ofrece Mérida. A 1 cuadra del mercado de Santiago, donde puedes comprar fruta fresca, verduras, pescado y carne todos los días. Tenemos restaurantes locales cerca que se adaptarán a todos los presupuestos. A solo 4 cuadras de Santa Lucía ya solo 5 cuadras de la plaza principal, el Zócalo. Tenga en cuenta que los viernes y sábados Mérida se convierte en la fiesta central. Tenemos 2 fuentes que proporcionan ruido blanco y las habitaciones están fuera de la calle. Sin embargo, si necesita tranquilidad absoluta y fines de semana, le recomendamos alquilar una Hacienda en el campo o una casa en uno de los barrios más tranquilos, ya que el Centro es ruidoso los fines de semana. We have been visiting Merida for several years and know the city very well; and intend to live there for six months out of the year. The people and the weather are absolutely beautiful. The rich culture and history is fascinating as well. We chose this home primarily because of the location. Santiago has everything you need and Paseo Montejo, Santa Ana, Santa Lucia and the Gran Plaza are all well within walking distance. Great location. I have to concur with Marlene. The kitchen was tiny and that end of the house was very narrow. As a group, we would have preferred a larger area near the kitchen to hang out in. There was a large oudoor disco the next street over that thumped music on Friday and Saturday night until 2A or so in the morning. You will not be able to sleep upstairs or the front bedroom until it closes. The owner's response to Marlene's review was that every neighborhood is noisy in Merida and the guest should stay away from Centro. That's nonsense. Most neighborhood bars close at 10P (which are few); and then the only noise after that would be if you were on a bus route or main drag. Suggesting to a guest to 'stay in the suburbs', defeats the purpose of coming to Merida in the first place. The swimming pool pump and fountain were inoperable; and it seems that it has been that way for an entire year. Marlene's post was January 2018, and our stay was March 2019. Two technician's came in with a portable pump filter one day to clean it, for about ten minutes. But the rest of the week was a stagnant pool; no filter and no fountain that we really enjoy in most of the homes that we have stayed at in Merida. The master bedroom's air conditioner was very noisy. After three nights and two service calls and a new motor later; we finally got a night's sleep. The furniture and art is typical compared to other nicer homes that are available. Look around, compare and read the reviews; Merida is a wonderful place and your 'home' should be as carefree and enjoyable as possible. Our group of 6 absolutely loved the home and location. Tons of character and very spacious. The pool was very refreshing too. Nicolette was easy to work with and helped us arrange a special birthday dinner. Yoli the housekeeper cooked a wonderful Yucatan meal one evening too. Would recommend this place and would like to stay again someday. We had a great time and the house was perfect for us close to everything and plenty of room to spread out. Thanks for sharing your lovely home. It was perfect for our group of 8 (3 couples and two teenage boys). We really enjoyed the property and the city. Like so many house in Mexico, the street and the outside of this house belies the beauty inside that included several open air seating areas, three bedrooms with private ensuites, air conditioners and fans (perfect for our group of three couples); a well equipped kitchen; three dining areas; a small but refreshing pool; attractive water features and landscaping that included a huge cactus that housed a nesting pair of doves which we saw as a good omen. The top floor bar and seating area was magical for watching the sun set. This house hits the sweet spot between elegance and comfort. As one member of our group said 'I would recommend this place to anyone going to Merida'. The six of us are all very well travelled and have rented several houses in several countries. This one was certainly one of the best. The owner is wonderful to deal with and the onsite staff very helpful. My only bit of advise especially if you are driving as we were, is to get very specific directions since Merida has a complicated street numbering system and our GPS let us down. Great location except every Friday and Saturday their is an outdoor disco one street away which is very loud until 3 am. Doors and windows closed, air conditioner on, yet you felt you were on the dance floor. Take your ear plugs. Kitchen needs updating, very small for such a large house. The furniture is very tired. The house couches and outdoor furniture is in need of a good cleaning at a minimum. They were badly stained. Not all air fans moved the air. Doors did not close. This is a three bedroom, with the forth bedroom off the master with two twin beds. Pool pump was not working properly. After several service calls they could not repair. Overall this house needs to be updated. Too bad. We work very hard to maintain our property to the highest, reasonable standard and accurately represent it on the website, including the details about the neighbourhood and noise. I have as yet, not come across a neighbourhood in Centro that is not noisy. You need to go to the suburbs and even then the traffic noise is high. We were in Merida doing renovations right before this group arrived and when we left our property was in the best shape it has ever been. As this is the first ever review that is this negative, and this after we had just spent a week doing maintenance and updates to our property, we are rather baffled as everyone else has always felt that the value for money was there and left excellent reviews. Situado a sólo una cuadra de la popular Parque Santiago y la plaza, nuestra casa es un paseo fácil a muchos de los lugares de interés, restaurantes, bares y tiendas en la ciudad de Mérida Centro Histórico .... Mérida es verdaderamente una ciudad para caminar y nuestra casa está en una ubicación privilegiada para sacar el máximo provecho de ello. Electricity costs are charged separately and need to be paid in cash on check out. Our house manager can show you how to track your usage and calculate the rate so you can keep an eye on it throughout your stay. Costs are very variable depending on usage. Housekeeping services are included on Mondays and Fridays. House keeper is available for extra hours/days at an additional cost and also offers cooking services. Please enquire for details. Short stays of less than 6 nights are charged an additional cleaning fee of USD45.